Edward Gordon Craig, drawing for the first scene of the second act of Acis and Galatea by Handel, London, 1902. The aim of the conference is to examine the way that opera scores envisage or rather prescribe the stage setting. 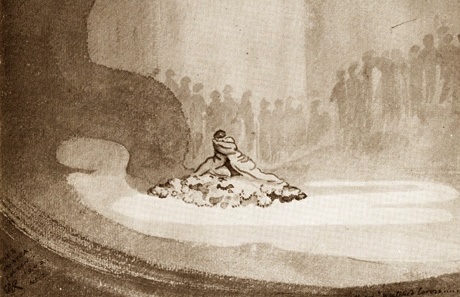 Evidence of the development of an awareness of stagecraft in 19th-century composers is found not only in the writings of Wagner and the letters of Verdi but also in the increasingly important use of the spatial dimension in opera stage designs. This trend grew in the first half of the 20th century in concomitance with the advent of stage directing as a specific art form, which became an indispensable reference point for studies on opera. Although the close relationship between word, music and image has been recognised as essential, essays on the subject still have several lacunas. In particular there is a lack of a systematic, well-tuned perspective at the theoretical level able to provide a solid base for identifying and assessing the musical elements that influence the organisation of the stage space in its various components (images, requirements, movements and gestures). The conference sets out to offer a contribution to the development of this historical and theoretical approach. The first session (Composing the Stage between Verdi and Wagner) includes papers by Luca Zoppelli, Gundula Kreuzer and Riccardo Pecci; the second (The Normative Ear: New Stages for the Opera) will feature presentations by Maria Ida Biggi, Donatella Gavrilovich and Clemens Risi; the participants of the third session (The Composer’s Eye: The Stage Space in three Scores) will be Marie Lavieville Angelier, Dörte Schmidt and Tommaso Sabbatini. The conference will be coordinated by the scientific committee, including Maria Ida Biggi, Gianmario Borio, Giordano Ferrari, Michele Girardi and Isabelle Moindrot. The event has been created thanks to collaboration between the Institute of Music and the Study Centre of Documentary Research in European Theatre and Opera at the Fondazione Giorgio Cini with EA Esthétique, musicologie, danse et création musicale, Université Paris 8 and with Università Ca’ Foscari in Venice. The initiative is part of the project Vers le présent de la dramaturgie musicale à travers l’idée d’espace ‘sensible’, coordinated by Giordano Ferrari in the Laboratoire d’excellence Arts-H2H (programme Investissements d’avenir, ANR-10-LABX-80-01) directed by Isabelle Moindrot, which brings together the art research workshops of the Université Paris 8 and Université Paris Ouest with some kindred art institutions, including the Centre Georges Pompidou, the Conservatoire National Supérieur d’Art Dramatique and the Bibliothèque Nationale de France.